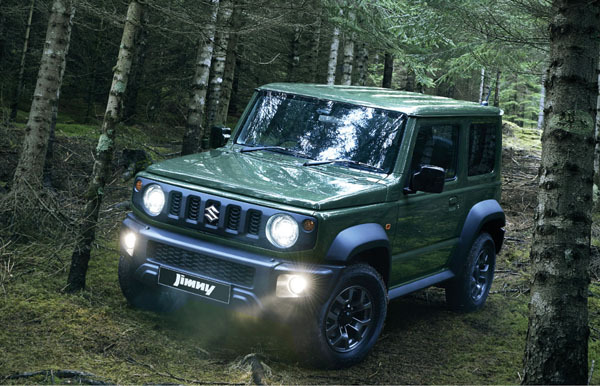 Suzuki Jimny is quite simply the most talked about vehicle on the planet. Forget the multi-million-dollar, ridiculously-overpowered vehicles just unveiled at the Geneva Motor Show, the cute-as-a-button Suzuki is the one that is dominating car-nut conversations everywhere. Suzuki Jimny simply has no competition. No one else builds a low-cost, small, genuine 4WD. The closest vehicles come from Jeep and Land Rover, but they are out of the Jimny’s price class. We’ve just spent two weeks in a brace of new Jimnys, one a manual the other automatic. I must admit being wrong when first sighting new Jimny in the metal at the Queensland launch, feeling that it was just too boxy. But after seeing it on the road and watching the attention our test Jimnys got from passers-by I’ve fallen in love with it. The interior features a neat old-style dashboard, but it’s bang up to date with big easy-to-read instruments and a sensible infotainment screen. The touchscreen housing somehow manages to look both retro and high tech at the same time. Even at a price that’s under $25,000 you get a 7.0-inch touchscreen, satellite navigation, Apple CarPlay and Android Auto. 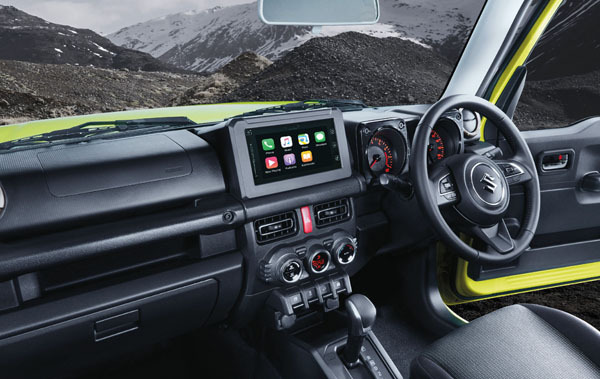 The audio system does hark back to the days of the just superseded Jimny, with only two speakers and sound quality that really should be better, let us call it part of the charm. Power comes from a 1.5-litre four-cylinder petrol engine with 100 horsepower (75 kW in Aussie numbers) and 130 Nm of torque. The torque peak is at a relatively high 4000 rpm, but it feels fine from about 2000 and there’s a nice spread of grunt in all normal driving ranges. The engine sits in front of either a five-speed manual or four-speed automatic. See the Driving segment of this review for more comments on this. All four wheels are driven by way of a transfer case with 2H, 4H and 4L modes that are selected by a lever on the centre tunnel. The front seats are larger than in the superseded Jimny and, due to the squared off body, you don’t feel you’re rubbing against the person sitting alongside you. There’s more space in the back seats and they have reasonable legroom. Small … tough … ladder chassis … rigid-axles … heavy duty suspension. 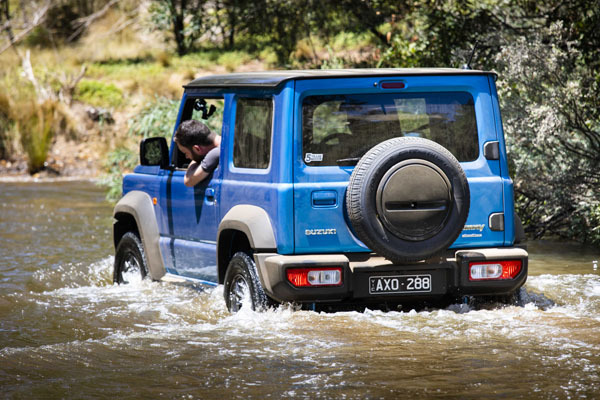 All are excellent features in a genuine 4WD. But make it very difficult to build a tiny vehicle that collapses well in a crash. The result is that Jimny only has a three-star crash rating. Look it up on Youtube, though, and you will see it fares better than you might expect. In any case the most important safety feature is not crashing. The little Suzy has autonomous emergency braking and lane departure warning systems to help you stay out of trouble. If things still go pear-shaped there are six airbags to help protect everyone, and IsoFix mountings for the littlies. One more gear in the manual and a two more in the auto would have been appreciated on the open road, particularly on motorways. Around town the manual and auto both feel fine and the NVH (noise, vibration, harshness) levels are noticeably lower than on the old Jimny so the interior is more sedate than you might expect. It’s not to small-hatch standards but surprisingly close. Handling is good with levels of grip and ease of control at speeds that belying that fact that it’s a body on chassis 4WD. The steering feels a bit vague at times as on old-style truck-based 4WDs. The secret is to avoid correcting every tiny little movement and let the Jimny make its own corrections. Strong crosswinds do move it around at times, something that would be very tiring on a long trip. This is perhaps the only thing we really didn’t like. As part of the media launch in January we did serious off-road driving on moguls and steep, deeply rutted hill trails. The new Jimny has even better approach / ramp-over / departure angles than the old, which were already excellent. Maximum grip is by way of Suzuki’s All Grip Pro system. Jimny takes you places where other alleged SUVs would get well and truly stuck and does it so easily that it feels more like a stroll in the park than a battle with the terrain. The baby Suzuki’s shape isn’t just to make it look good, it’s very practical in the way every cubic centimetre inside can be used. Boot space is ridiculously small and can’t even cope with an extra-large suitcase, a couple of cabin bags are fine. The back seats fold down to give you a large level cargo space. You can also fold the front passenger seat almost flat to provide enough length to carry a ladder or long surfboard. Folding down the driver’s seat as well as the two rears makes a vaguely comfortable double bed. 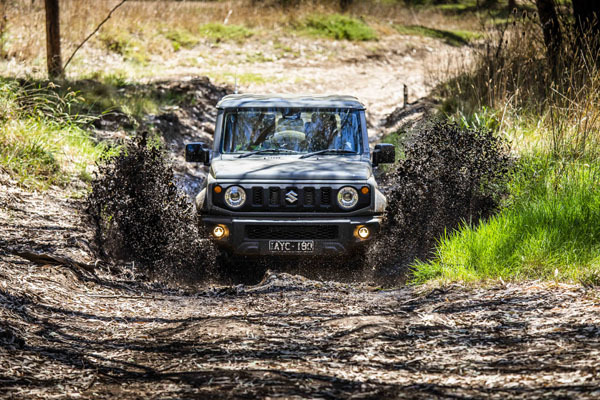 Suzuki Jimny is a brilliant example of styling and 4WD engineering. If you enjoy adventurous weekends but live in a big city and can only afford one vehicle the Jimny should sit at the top of your short list. Note: These prices do not include government or dealer delivery charges. Contact your local Suzuki dealer for drive-away prices.